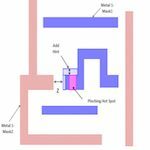 A detailed dive into how MBH strategies for litho hotspots have been enhanced to deal with double patterning at 20nm and below. How to address increasingly complex patterning issues and debug them efficiently as design moves toward 12 and 10nm. GlobalFoundries intends to offer a 12nm FinFET process as a stepping stone from its 14nm process.